Having a 4,000+ sqft house has it’s upsides, but at some point all that upkeep can start to get old. Many people decided to downsize at some point in there life, but there are many challenges that come with a smaller home. 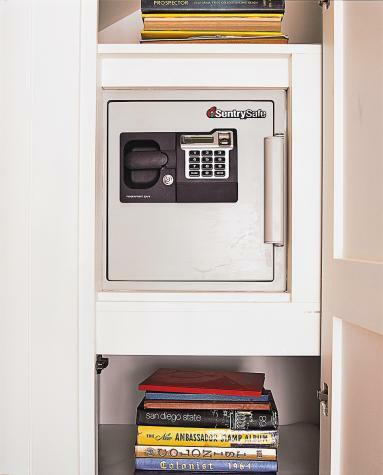 Finding space for all of your stuff can be the biggest barrier. A family in California got creative when it came to making space in their new downsize. The 1940s cottage offered many pluses. Located about 300 feet from Newport Bay, the house featured a private courtyard and a living room with a charming, vaulted wood ceiling. On the minus side, it was a one-story, nondescript stucco house that totaled just 1,225 square feet; their old house held 3,800. 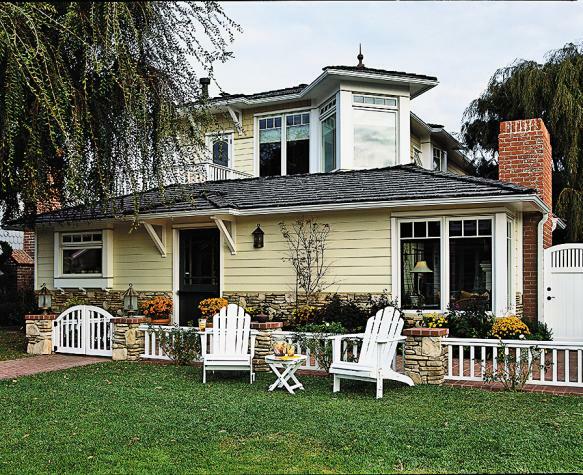 They also wanted to maximize storage and views of the bay—all without destroying the vintage cottage’s character. Given the home’s narrow, 45-by-97-foot lot, the only way to provide more space and maintain the views of the bay was to build a second-floor addition. The back, street-facing side of the house, where the garage is located, remained unchanged. But everything between it and the kitchen—the dining room, three bedrooms, a bath and a half—came down. Even though the new spaces added 775 square feet, the house was still compact enough to -require some innovative thinking. 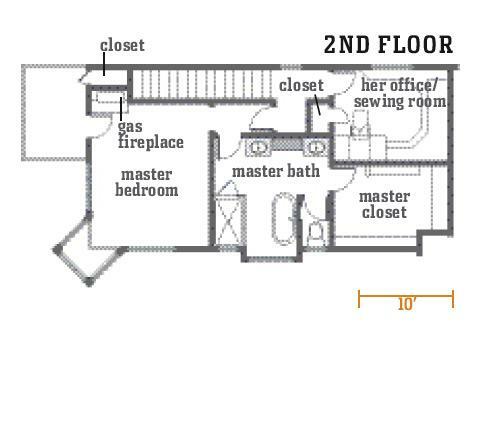 One of the most unusual aspects of the revised layout was that it eliminated nearly all interior hallways, using rooms as traffic corridors instead. 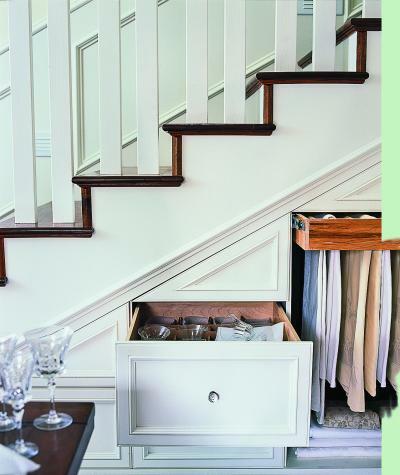 When entering the house from the garage, for example, the traffic flow leads you through the mudroom/laundry and the guest bedroom before you reach the living room. Leaving out hallways was essential to saving space in the house. Similarly, the only door from the side yard into the house opens directly into the first-floor bathroom, making it a convenient stop for cleaning off sandy feet. And instead of creating a hallway to accommodate the added stairway, stairs were placed at one end of the new dining room, reasoning that the open space above the stairs would add a sense of airiness in the modest dining space. 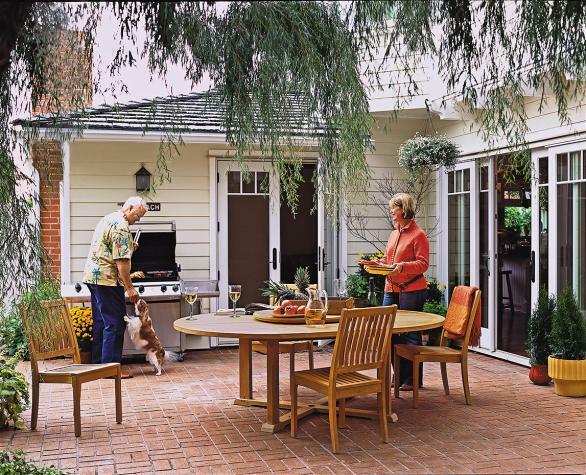 Even the courtyard functions as a hallway, an option in southern California’s warm climate. Maybe not the best option if the weather isn’t accommodating but still a great idea. 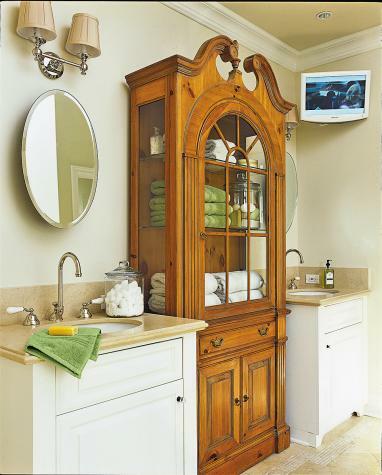 This beloved antique hutch was incorporated into the master bath as a linen cupboard. The clear glass shower enclosure allows for an open sight line straight to the outdoors, making the modest space feel bigger. 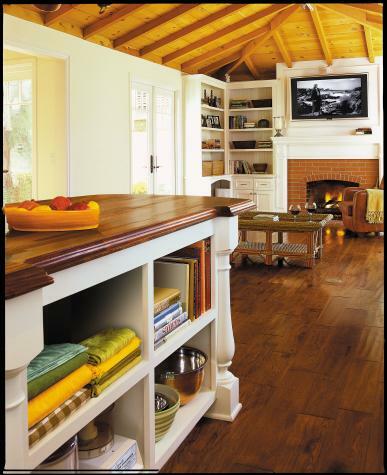 Unconventional solutions and visual tricks aside, it is the built-ins that really make the cottage function in a big way. Under the stairs in the dining room, for example, carpenters created drawers for china and hanging rods for table linens. 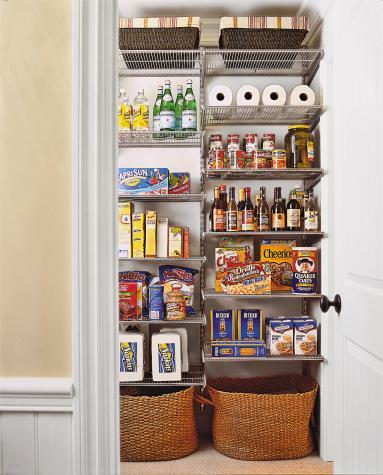 Taller under-stair space, along with part of an old bedroom, was claimed to make a pantry for space-gobbling quantities of household staples and a safe. Instead of putting the pantry door in the dining room, where it would interrupt the only wall free for furniture, the architect located it in the first-floor bath. Cabinets stretch to the ceiling in the mudroom, which doubles as a laundry room. 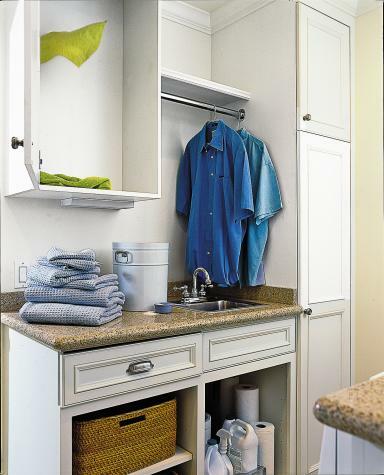 An upper cabinet in the mudroom/laundry conceals a chute for dirty clothes that originates in the master bedroom closet. The kitchen grew from a meager 8½ by 10 feet to an adequate 14 by 10 feet, every bit of it packed with storage. Upper cabinets line three walls, with a plate rack and glass-door cabinets for visual variety. A copper 1950s Chambers stove, beadboard cabinet doors, and Calacata Gold marble give it updated vintage charm. 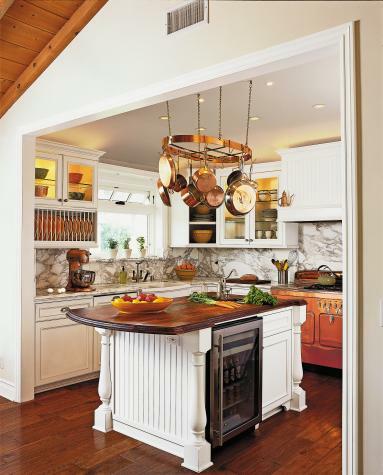 Both corner cabinets contain swing-arm slide-out shelves; deep drawers in the island and a hanging rack overhead hold a collection of copper pots and pans. With a U-Line wine cooler, plus a small overhang for seating, the island is packed with function. It is topped with iroko, a sustainably harvested (and well-priced) exotic hardwood. To make the kitchen feel more spacious, the ceiling was vaulted, rising to 9 feet above the island, echoing the original exposed ceiling in the adjacent living room, which rises to 10½ feet. The living room’s original fir ceiling was stripped of stain and then clear-coated for a lighter look. 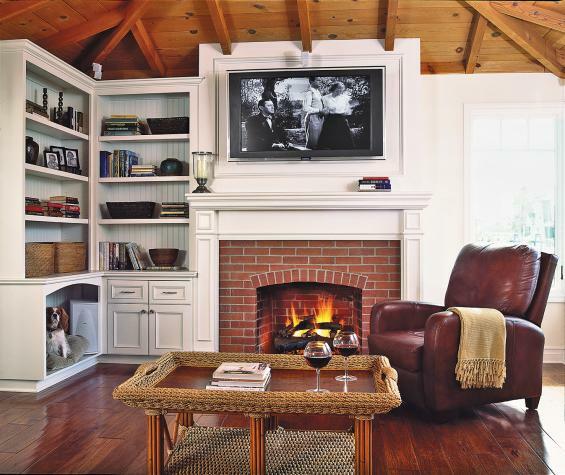 The bookcases, mantel, and moldings—including the frame for the flat-panel TV—are all new but in keeping with the clean, simple style of the 1940s cottage. The living room remains the heart of the original house, with its newly sandblasted fir rafters and brick fireplace. It set the tone for the cottage-style materials used throughout, including hickory floors and raised-panel or beadboard cabinetry on the interior, and clapboard siding and shingles on the exterior. And what of the 1,800 square feet of space the couple sacrificed in the move? They don’t miss it a bit. 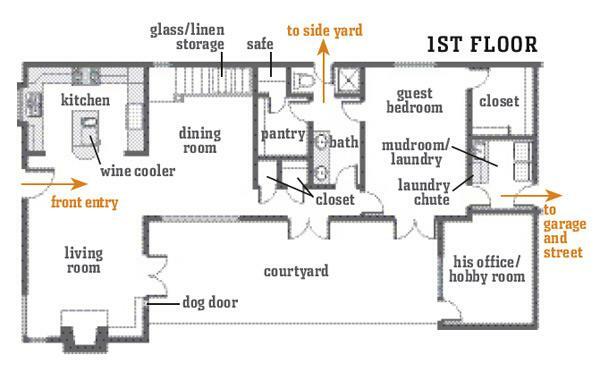 A new two-story section rose between the kitchen/living room end and the garage end; a new office was also created off the courtyard. The end result: a compact, comfortable 2,000 square feet of space, with one short hallway and tons of storage.